Each image can have a caption, and the slideshow can be advanced automatically or manually. 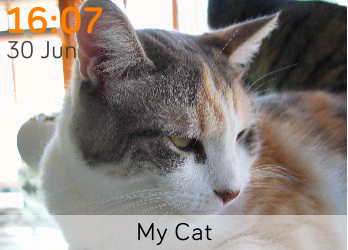 The time and date can be displayed, and can be coloured and positioned differently for each picture. To get started, open the Slideshow Settings page on the Fitbit app on your phone or tablet. Be aware that image transfers can take a minute or more, and may not be possible at all on Windows 10. 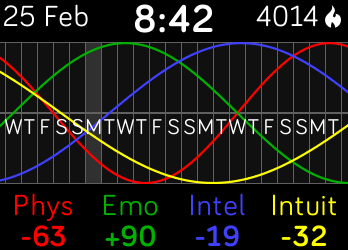 Some settings can also be adjusted on the watch. To access these, long-touch the screen, or press the upper right side button (if available), while the slideshow is playing. Slideshow Pro costs US$1 (plus local taxes) after a 48-hour trial period. Why is the 'Run in Background' permission needed? How do I get the settings screen to appear? How come my image won't transfer to my watch? Will it drain the battery quickly? What do I do with the five-digit payment code? Where can I find more info about payment for this app? Why is the 'Run in Background' permission needed? It probably isn't. However, the image transfer process is fairly finicky (see below), and one reason for possible failures is that the app that handles the settings on the phone/tablet/computer can be closed by the operating system when it's actually still needed. The exact behaviour varies greatly between devices. The 'Run in Background' permission should reduce the likelihood that the settings app will be closed prematurely. Note that this permission only affects the behaviour of the app on your phone/tablet/computer; the part of the app that goes on your watch will not run in the background. How do I get the settings screen to appear? You should be able to display the settings screen by pressing the cogwheel icon for Slideshow Pro within the Fitbit app on your phone/tablet/computer. Make sure the Slideshow Pro app is running on your watch before going to the settings screen. If you haven't sent any images to the watch yet, it should say 'No Images'. Make sure the Fitbit app on your phone/tablet/computer is updated to the latest version. Unfortunately, the Windows 10 version of the Fitbit app is especially unreliable with complicated settings screens. Try using an Android or iOS device instead. How come my image won't transfer to my watch? Unfortunately, Fitbit's file transfer code is notoriously unreliable and slow. It can take several minutes for a slide to be transmitted, so you do need to be patient. The process seems to be more reliable if the app is running on the watch before trying to send images. If the watch app hasn't received any images yet, it should say 'No Images' when it's ready to receive them. File transfers can be problematic if your watch is currently syncing with your phone/tablet/computer. Wait until the sync has completed before trying to send images using Slideshow Pro. If a file transfer is interruped part way through, there's a chance that the Slideshow app will be left in an invalid state. Uninstalling and reinstalling the app fixes this (sorry!). Worse, sometimes the Fitbit app itself gets clogged with file transfers, requiring it to be force-stopped and restarted and/or having its storage data deleted. Fitbit is continually striving to improve the reliability of communications to and from the watch. Make sure you're using the latest versions of the Fitbit app and watch firmware. Will it drain the battery quickly? 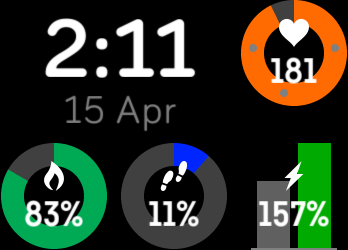 If the 'auto-off' setting is deselected so that the screen stays on all the time, your watch's battery will be drained about four times faster. It may only last about a day between charges. This battery consumption is not caused by the Slideshow program, but by the screen hardware. Even a trivially simple app that prevents the screen from turning off will drain the battery at about the same rate. If you want to test this, try the free 'On Time' app. If you don't want to recharge the battery more often than necessary, make sure the 'auto-off' setting is ticked, except when you really need the screen to stay on (eg, when showing your slides to friends). To get to this setting, long-touch the watch's screen while the slideshow is playing, or press the upper right side button (if your watch has one). When the screen is off, Slideshow doesn't do anything and will not have any impact on battery life. What do I do with the five-digit payment code? Slideshow Pro isn't free (but it is cheap!). If Slideshow Pro is displaying a five-digit payment code, it's time to buy it. To continue using Slideshow Pro, use a web browser and browse to https://k-pay.io/code/. 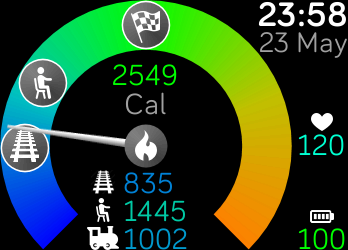 That's where you type in the code that appears on the watch. After clicking 'Continue', you'll be given options for paying for Slideshow Pro. A minute or so after payment has been received, you'll be able to use Slideshow Pro.